A month ago the internet was buzzing with good news: a 20 kilometer (12.5 miles) four lane cycle superhighway in Sweden would connect the cities of Malmö and Lund. It won’t happen soon; development will take at least 8 years, but the news coverage in English makes two things sound very intriguing: “the route will be four lanes wide and feature exits but no intersections”. Wow! That must be so wide and does that mean there will be no level junctions? That would indeed be very special and a world’s first. But if you then look at the number of junctions on the map and the budget (50 million Crowns – or 5.6m euros), you think: is this all really possible? 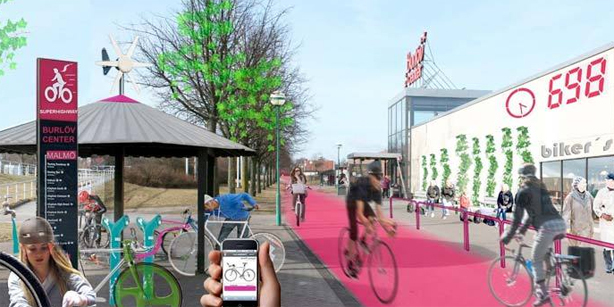 Rendering of the Malmö-Lund cycle path. The 4 lanes are not really visible. The Photoshopped helmets are very annoying! So I looked for the Swedish sources of all this news and found the pilot study for the plans on the site of trafikverket.se. 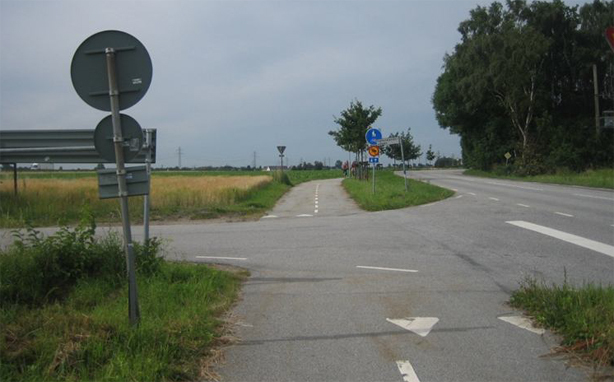 On page 3 in paragraph 1.1. of chapter 1 (Background) we find the proposed width of the cycle paths: I förstudien sätts måttet till mellan 3-5 m. Which means: “The preliminary study sets the measurements between 3 and 5 meters.” (9.8 to 16.4Ft) That is exactly the same width as Dutch bi-directional cycle paths! That means that when they paint four lanes on the route these lanes would be between 75 centimeters and 1.25 meters wide. The only difference is that the Dutch just paint a middle line because riding side by side is very important in the Netherlands. However, for overtaking that does not make any difference. Number of multi-level crossings: 2 to 4. Two to four multi-level crossings in the entire 20 kilometer route one of which is a bridge over water… That does not at all sound like all the crossings will be multi-level. Especially since the current route has a number of smaller junctions like these (below) where now cyclists even have to give way to turning cars. A situation that would be unthinkable in the Netherlands. Which, I think, is what is really meant by “improving” the junctions: changing the priority so that cyclists would not have to stop so often and thus making the route faster. To conclude: if we take away the spin this is still a great plan for Sweden and I really hope for the people of Lund and Malmö that this path will indeed be there in 8 year’s time. But the fact that of the 50 million Crowns needed only Malmö has 29m. and Lund has not a penny doesn’t sound promising. What I really do not understand though, is why the entire cycling world got so exited about this. There is really no difference between these plans and the cycle paths already existing in the Netherlands. So why don’t people look to the Netherlands for inspiration? It is the difference between real live examples that have a proven effect versus plans on paper. In my series of high quality fast cycle routes I will now show you the fourth example that I stumbled upon by accident. The 11 kilometer (6.8 miles) long route between the towns of Oirschot and Boxtel. It was hard to find good info on the project, because to the Dutch this is just another cycle path, but I did find some information at last. The cycle path was opened in August 2007 and has cost 8 million euros, financed by the two towns Oirschot (pop. 10,000) and Boxtel (pop. 24,000). It was built along the same road where in 1906 a cycle path had already been built. But that 1906 path was neglected because Oirschot and Boxtel couldn’t decide who had to pay for the maintenance. It was overgrown by plants and slowly completely disappeared from the 1940s on. The new version is bi-directional on one side of the road. There is one crossing of that road where the cycle path switches to the other side. This was to be a multi-level crossing in the original plans. But the two small towns could not fund that bridge and since neither the region of Eindhoven nor the national government wanted to give additional funds it is now a level crossing. One of only two crossings where cyclists have to give way to motorized traffic in the entire route. The main reason to build this cycle path was safety. The route was and will be used a lot by school children and in the before situation 12 incidents per year happened, of which 4 with (some kind of) injuries. The towns had to acquire land of people and organizations to be able to build the cycle path. It is 3.5 meters (11.5Ft) wide and runs 1.5 meters (5Ft) from the road where possible. If the road is closer it is shielded by a hedge. This is a perfect cycle route, fast and with smooth asphalt. There is only one reason why this path cannot be called a cycle superhighway: at night only the junctions are lit, not the entire length of the route. Video showing some background info on Oirschot and Boxtel and the entire route. This was a fourth look into a fast cycle route in the Netherlands the other three can be found here. Not to mention the fact that in many cases, adequate cycle lanes already exist on the same route. I don’t know how it is in Malmö, but this is the reality in Stockholm. I wish politicians focused on building good and safe infrastructure where none exists (which is almost everywhere in Stockholm), rather than replacing existing functional infrastructure with big words. In Stockholm the reality is that 2m wide two way bike lanes with a line to separate from pedestrians are still being built! Yes, TWO meter wide, TWO way bicycle lanes… Insanity. I think that the Dutch attitude to this kind of facilities as to ‘just another cycle path’ is part of the problem 🙂 A lot of cities and countries tend to overhype their efforts in developing cycling infrastructure even if the result is mediocre. Thus they get most of the media attention while real exemplary work go unnoticed. And the train passing by just when you cross under!!!! Perfect synchronization!!! Congrats from Zaragoza,Spain. I wish one day our politicians watch your marvelous videos. I was wondering if all the publicity this project was getting caught your attention. As Malmo is my hometown, this post is near to my heart. Your criticism is fair, the Dutch do set the standards high for the rest of the world and I don’t understand why they’d have multiple ‘lanes’. It seems like it’ll just over complicate something that is really quite straight forward in an attempt to be more like a freeway or car like facility and thus it seems more advanced or high tech? Malmo and Lund are both nice cities to cycle in and I find it really interesting that the way Malmo treats intersections is more similar to Dutch intersections than to Copenhagen intersections. Bicyclists are protected at intersections and can make right turns uninterrupted. 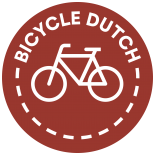 This entry was posted on 27 February 2012 by Bicycle Dutch in Original posts and tagged Boxtel, cycle superhighways, infrastructure, long distance cycle paths, Oirschot, ride, Sweden.